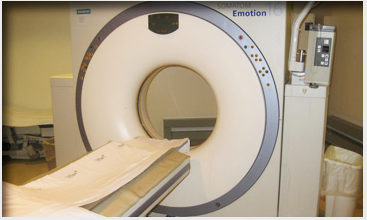 Computed Tomography (CT) scanning is a rapid, painless diagnostic examination that combines highly sophisticated X-ray systems and computers. A CT scan allows the radiologist to see the location, nature and extent of many different abnormalities or diseases inside your body. A sequence of low-dose X-rays are taken by a rotating X-ray tube. You will lie on the table as it moves through the gantry (a large donut-shaped ring). Images are acquired by detectors that pick up the X-rays that pass through your body. Information is processed by the computer and images are generated for the radiologist to review and interpret. Some CT studies require a contrast agent to be injected through a vein in your arm. In addition, some abdominal CT scans require that you drink oral contrast prior to your exam. The contrast agents make vascular anatomy and other body organs more visible on the images. You will receive special instructions if contrast is required. 1. Please notify us 24 hours in advance if you are unable to keep your appointment. 2. Please come to your appointment 15 minutes early to allow for the completion of necessary paperwork. 3. Tell your doctor and the technologist if you are pregnant or think you might be. 4. Bring Insurance cards and a picture ID and your doctor’s order if you have it. 5. Bring previously completed related studies, such as X-Rays, CT, or MRI scans on CD if available. 2. Drink 1 bottle of contrast 3 hours before your exam. Drink the second bottle of contrast 1 hour before your exam. 1. Pick up 1 bottle of oral contrast from our office at least 1 day prior to your appointment. 2. Do not have anything to eat or drink for 2 hours before your appointment. 3. Drink 1 bottle of barium 1 hour prior to your appointment.